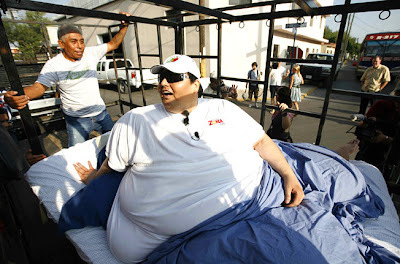 Hot and sweaty ... Manuel Uribe, who was once the heaviest man in the world but now weighs around 310 kilograms, visits a lake at Santiago, Monterrey in northern Mexico, on a truck holding his specially designed bed. Hang about ... Mr Uribe, who is better known as "Meme", left his home for only the third time in six bedridden years for the trip, part of a postponed birthday celebration. Big grin ... Mr Uribe smiles while girlfriend Ms Solis looks on. 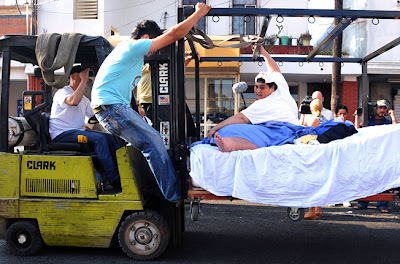 Going up ... a forklift carries Mr Uribe on his bed to a truck which will take him to the beach. On the road ... Mr Uribe and his bed are placed on a truck outside his home in the suburb of San Nicolas de los Garza, in Monterrey. Waiting ... Mr Uribe waits for the forklift outside his home. Down the ramp ... friends of Mr Uribe pull his bed out of his home in preparation for his belated birthday trip to the beach. A MAN once believed to be the world's heaviest has gone on a daytrip, bed and all, from his home in northern Mexico to a local lake. Manuel Uribe, who once tipped the scales at 560kg, was hauled from his home on a forklift and loaded onto a platform truck for the weekend day trip, the Associated Press reported. 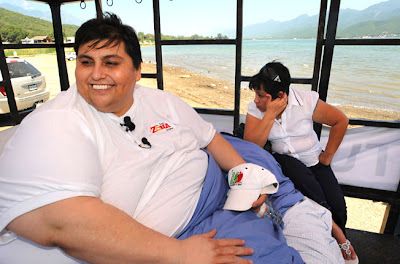 Mr Uribe, who now weighs around 310kg, stayed on his specially designed bed throughout the trip to the lake, where he dined on fish and vegetables. It is the first time Mr Uribe has left his home in five months. Unable to walk, his last planned outing in March was abandoned after the platform carrying his bed got stuck under an overpass. His last successful trip outside his home was in March 2007, when six people pushed his bed out to the street as a mariachi band played and a crowd gathered to greet him. Before that, he hadn't left his home in five years.